I have been drawing for as long as I can remember. Aged 6 (36 years ago!) I announced to my parents that I wanted to be an Art teacher – following closely in the footsteps of my 2 Aunties. I have always loved experimenting with both drawing, painting and mixed media. Printmaking was introduced to me at Art School much further down the line. The concept for this piece stemmed from a walk in Brancaster Staithe, North Norfolk last summer. It was a blistering hot day and when we reached Barrow common I was stuck by how dry and parched the landscape was. We could have been in a Mediterranean country! The views from the top of the common looked out towards the sea. I was interested in the geometric shapes, layers and strong horizontal bands within the landscape. Drawing is central to my practise as a Printmaker. The initial drawn marks form the nuts and bolts of my lino cut prints. 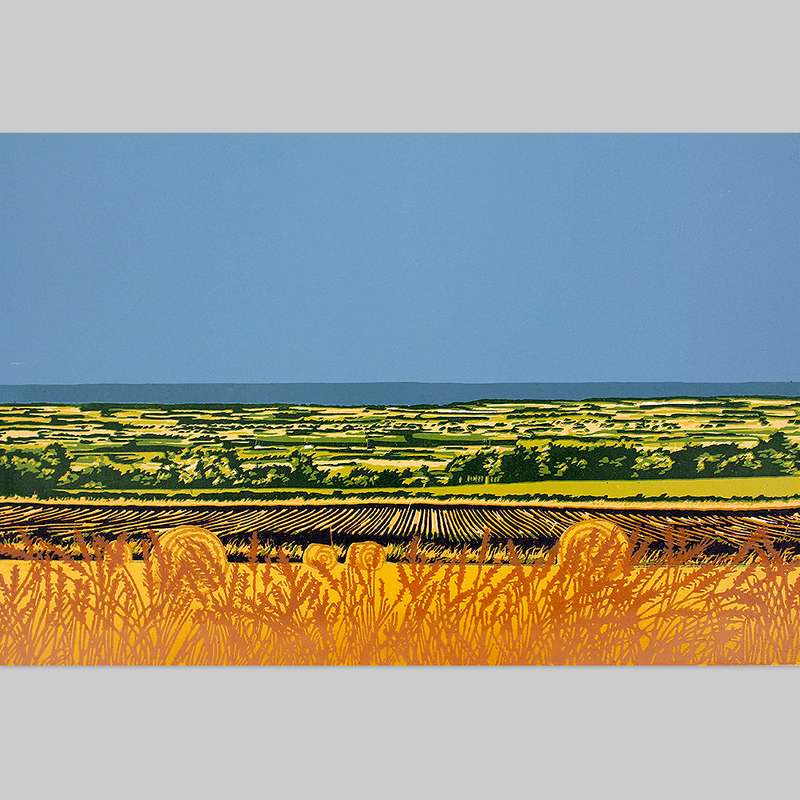 Thematically this piece has been produced independently of my other Lino cut prints, however there are other North Norfolk inspired pieces in the pipeline. In recent times, my work has been derived from the natural landscape. We are fortunate to live in the Surrey hills and my inspiration is mainly taken from landscape that is right on our doorstep! Hillside views, fields, wide skies and horizontal bands are elements that I have become drawn to and are visited and revisited in my prints. The landscapes reveal themselves slowly and require an element of patience! As does the creative process which requires intricate cutting and layering of colour which takes place over many weeks. Originally from New Zealand, printmaker Jennifer Jokhoo works from her home studio in the Surrey Hills. In 1997, she graduated with a Bachelor of Fine Arts from Canterbury University school of Fine Arts in New Zealand (majoring in Painting/Printmaking with a minor in the History of Art) In 1998 she went on to complete a Diploma in Secondary Teaching. Since qualifying she has followed a career in Art education and has taught in New Zealand, Spain and the United Kingdom. 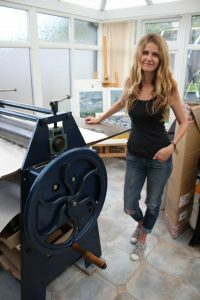 In 2012, she was elected a member of Greenwich Printmakers association. In May 2016, she was elected an associate member of the Society of Graphic Fine Art. Jennifer has an eclectic interest in architectural structures; recurring geometry, pattern and the effects of colour and light. More recently her focus has shifted to the natural landscape. Architectural structures are now starting to feature as underlying elements in Jennifer’s work. Each reduction linocut is produced by hand; from the initial drawings, to the intricate cutting, inking and printing of editions. Her limited-edition prints are crafted under the watchful eye of two Burmese cats and a Whippet!